Standard Industrial Respirator with Valve. See below for fitting instructions and warning information. Exhalation valve. Latex-free. 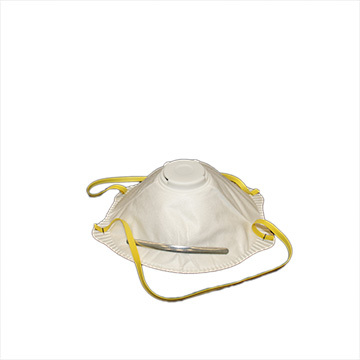 Disposable respirator. Hold the respirator in hand with the nose piece at your fingertips. Allow headbands to hang freely below hand. Cup the respirator firmly against your face with the nose piece on the bridge of your nose. Stretch and pull the lower headband over the head and position below your ears. Stretch and pull the top headband on the back of your head above your ears. Press soft metal nose piece to conform snugly around the nose. To test fit, cup both hands over the respirator and inhale sharply. A negative pressure should be felt inside respirator. If air flows around your nose, tighten the nose piece. If air leaks around the edges, reposition the headband for better fit. Change respirator immediately if breathing becomes difficult or respirator becomes damaged or distorted, or a proper face fit cannot be maintained. Careful observance of these instructions is an important step in safe respirator use. This product does not eliminate the risk of contracting any disease or infection. Failure to follow all instructions and limitations on the use of this product could reduce the effectiveness of respirator and result in sickness of death. Before occupational use of this respirator, a written respiratory protection program shall be implemented meeting all requirements of OSHA 29 CFR 1910.134 such as training, fit, testing, medical evaluation, and the applicable OSHA's substance specific standards. This product does not supply oxygen. Use only in adequately ventilated areas containing sufficient oxygen to support life. Do not use this respirator when oxygen concentration is less than19.5%. Do no use when concentrations of contaminants are immediately dangerous to health of life. Leave work are immediately and return to fresh air if (a) breathing becomes difficult, or (b) dizziness or other distress occurs. Facial hairs of beards and certain facial characteristics may reduce the effectiveness of this respirator. Never alter of modify this respirator in an way. Only for single use. No maintenance necessary. Discard the used respirator after single use. Keep respirators away from direct sunlight until use.